These Indonesian puppet figures are intent on getting something they can’t find at home—elegant cakes from Wien, a European style Korean bakery on Olympic Boulevard in Koreatown, Los Angeles. On the left is “rich cheese cake,” which is more delicately flavored and less dense than American cheese cake, despite its name. On the right is strawberry short cake, a light-as-air white cake crowned with berries. Wien’s stylish small cakes make pretty party desserts. The rich cheese cake is $4. Strawberry short cake is $3.75. Pick up an assortment of these and other flavors at Wien Konditorei und Café, 3035 W. Olympic Blvd., Los Angeles, CA 90006. Tel: (213) 427-0404. Navarro Vineyards of Mendocino makes a luscious non-alcoholic Gewürztraminer—adult grape juice that the kids will love too. The flavor is rich, sweet and honeyed, so delicious that you won’t miss the alcoholic kick. 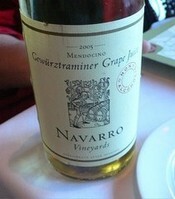 In case you do, Navarro makes Gewurztraminer as a wine too. The grapes for the juice were harvested in September, 2007 and bottled in October The wine grapes were harvested in 2006, and the wine was bottled in May, 2007. The juice is $11 a bottle. The wine is $19. Order either one through the winery. Call 1(800) 537-WINE or go to http://www.navarrowine.com/shop. For me, Christmas took place December 8. I mean, how much more Christmasy could anythin g be than the annual Vine Street Victorian Christmas Showcase in Paso Robles? Walking along this street of beautifully decorated Victorian homes, I saw everything from a live Nativity scene to Ebenezer Scrooge shouting insults from a balcony turned into his bedroom. “I hate Christmas. There is no Christmas,” he roared, to the delight of the crowd. Farther along, the Grinch tried to spoil the party too. For this one night, Vine Street between Eighth and 21st Streets was closed to traffic. Thousands strolled to admire the lights, line up for hot drinks and cookies, sing Christmas carols and listen to live music and story telling. There were even belly dancers, a brave undertaking on a night cold enough for long underwear and ski gloves. Dogs accompanied their owners, wearing Santa coats or illuminated harnesses. Babies attended too, sound asleep in decorated carriages. 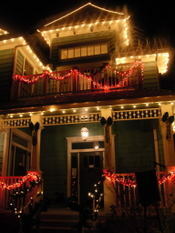 This charming, old fashioned community event is guaranteed to generate Christmas spirit, even if you feel like Scrooge. So plan on attending in 2008. You can get the schedule from the Downtown Paso Robles Main Street Association. Go to www.pasorobesdowntown or email mainstreet@tcsn.net. I was lucky to find lodging just two houses from the starting point at Eighth Street. 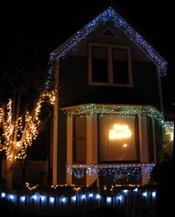 Although outside the showcase proper, Cabernet Cottage was decorated as prettily as if it were part of the display. As I sat on the doorstep watching happy celebrants go by in the dark, my breath formed steamy clouds, and I could almost see snow on the ground. Inside, it was cozy and comfortable, a warm refuge on such a cold night. The vintage furnishings, graceful drapes, dainty quilts and wood-burning fireplace echoed the Victorian spirit I had caught as I wandered along Vine Street. And the location was so central that the next day I could walk to shops, restaurants and wine tasting rooms in the heart of town. Jodekager, or Jewish cookies, are in my Aunt Helen's recipe file, and in almost every Danish cookbook that I have. They’re often listed under Christmas cookies, perhaps because they are crisp and buttery, like a good Scandinavian Christmas treat. The recipes vary slightly. Some call for hartshorn salt (amonium carbonate) as a leavening. Some flavor the cookies with lemon, vanilla or cardamom. I saw one recipe that included beer. My aunt put in akvavit, and when I was out of that, I substituted grappa. Denmark’s small Jewish community dates back to the early 17th century. I don’t know how this cookie came to be linked to that group, or why it became a standard Danish recipe. But there’s no need to know all that. Just bake the cookies and enjoy. In a mixing bowl, cream the butter and sugar together thoroughly. Beat in the egg yolk and add the lemon zest. Combine the flour, baking soda and salt and sift into the mixture. Add the akvavit or brandy and stir until smooth. Form the dough into an 8-inch long roll, wrap it in wax paper and chill a few hours or overnight until firm. Preheat the oven to 350 degrees. Remove the roll from the refrigerator and cut it in half. Slice each half into 15 cookies. Place the cookies on 2 lightly greased baking sheets, or bake half the cookies at a time, using a single sheet. Bake 9 to 10 minutes, until lightly browned. Watch carefully to avoid burning. Remove to racks to cool. Store in an airtight container. Makes 2 ½ dozen small cookies. If you’re shopping in the downtown Fashion District, head a little farther south to Washington Boulevard, and there, between Maple Avenue and Santee Street, you’ll find Lindo Oaxaca. It’s an odd place for a Oaxacan restaurant, but maybe locating in that area was smart. Traffic court a short walk away no doubt provides plenty of customers. I was one of them, and spotted other jurors in the place. 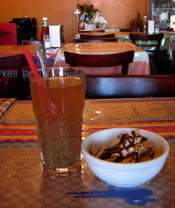 Open daily, Lindo Oaxaca has survived in that drab neighborhood for five years. The front of the building is a garish pink, so you can’t miss it. On one side is an open kitchen. The counter at the back is piled with crusty chunks of chicharron and breads brought from Oaxaca, the same breads that you would find in the Mercado 20 de Noviembre or in the huge Abastos market, according to the label. A small figure of the miracle-working Virgin of Juquila presides over the dining area, where the tables are covered with bright Oaxacan cloths. Photos pinned to her mantle show young people whose needs have been placed in her care. A tall slim cross and a vase of fresh flowers stand beside her. 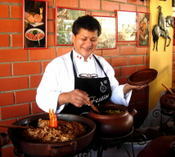 Run by people from Oaxaca city, the restaurant offers four types of mole (judging by the red mole served over chips, they’re pretty good), clayudas, entomatadas, enfrijoladas, memelas and other typical Oaxacan dishes. 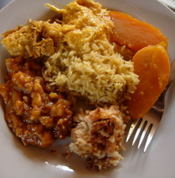 To drink there is chilacayota, a pale brown Oaxacan agua fresca that contains strands of the gourd from which it is made. Specials the day I found the place were barbacoa tacos and an ornate combination of grilled nopal cactus, Oaxacan meats and cheese. The meats arranged on top of the cactus were cecina (marinated pork), tasajo (salted beef) and several small, spicy Oaxacan chorizos, which were chewy at the edges and soft inside, rather like fine-grained meatloaf. 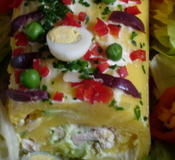 A layer of melted Oaxacan cheese (quesillo) covered the meats like a pale yellow serape. Black beans, rice and chewy handmade tortillas added up to a lunch filling enough to get me through a long afternoon of tiresome jury procedures. I would have gone back, but, alas, I didn’t make the cut for the jury. 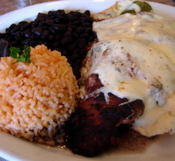 Lindo Oaxaca restaurant, 322 E. Washington Blvd., Los Angeles CA 90015. Tel: (213) 749-8723. Here’s just what you want on a cold winter’s day—a heartwarming bowl of delicious vegetarian chili. New on the menu at Joan’s on Third in Los Angeles, it’s made with three types of dried beans (kidney, navy and black), eggplant, zucchini, mushrooms and tomatoes and topped with Cheddar cheese and sour cream. Eat the chili at Joan’s for $4.50 a cup or $7 bowl or take some home for $7 a pint or $12.50 a quart. 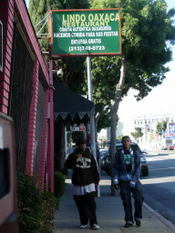 Joan’s on Third is located at 8350 W. Third St., Los Angeles, CA 90045. Tel: (323) 655-2285. 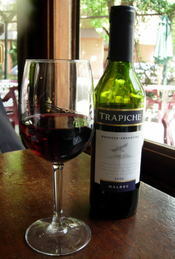 Trapiche Malbec 2006. This inexpensive Malbec is the type of wine you’d find at a home barbecue in Argentina. Trapiche makes more expensive Malbecs, but this one is all you need to go with zesty foods such as Argentinian grilled beef with highly seasoned chimichurri sauce or American barbecue with spicy, sweet marinades. The wine is worth searching for, because 2006 was one of the best vintages in recent years in Mendoza, Argentina’s main wine district, where Bodegas Trapiche is located. I picked up a bottle for $6.49 at Catalina’s Market, 1070 N. Western Ave., Los Angeles, CA 90029. Tel: (323) 46 1-2535. 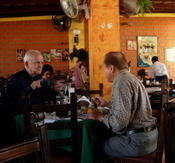 The photo shows it at Café-Bar Montecarlo in Palermo Viejo, Buenos Aires. For more information, go to http://www.trapiche.com.ar.